Amazon has Sonnenglas: Original Premium Solar LED Lantern for $24.49 (Reg $34.99) with free shipping. SONNENGLAS harvests the sun’s energy during the day and stores it in the built-in battery. 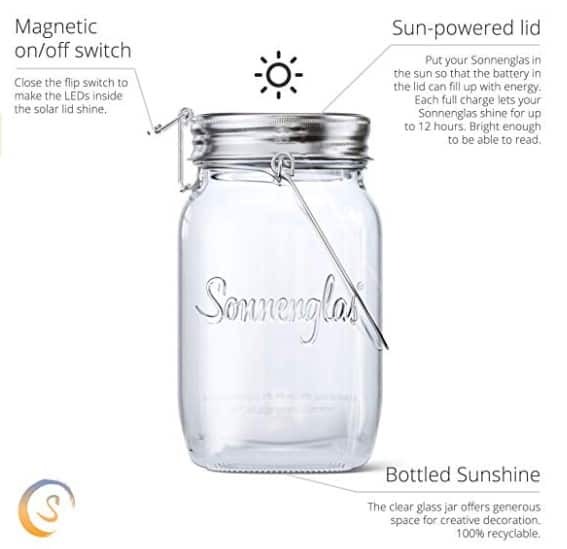 In the evening you can switch on SONNENGLAS with the magnetic switch and enjoy the bright light from 4 high-efficiency LEDs that transform the jar into a lantern with a lighting capacity of up to 12 hours after a full solar charge.